If you’ve read something provocative, thoughtful or mildly outrageous about health care in recent years (sample headline: “Why I Hope to Die at 75”), there’s a decent chance the author was bioethicist Ezekiel Emanuel, M.D. — oncologist, White House adviser on Obamacare and talking head. In this extensive interview with veteran journalist Paula Span, Dr. Emanuel discusses his pride in the Affordable Care Act, his controversial views on physician-assisted suicide (“a big, big distraction”), and his childhood with brothers Rahm, now mayor of Chicago, and Ari, the Hollywood uber-agent. Plus, raisin challah French toast. Part of Amazon's monthly series of Kindle Singles Interviews, it is downloadable to any device -- desktops, laptops, tablets, phones, e-readers -- for 99 cents. 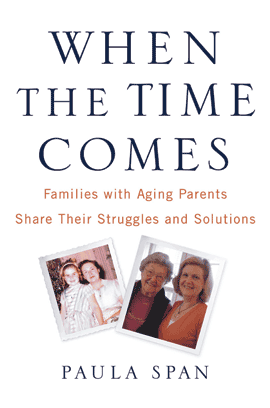 The print edition of “When the Time Comes: Families with Aging Parents Share Their Struggles and Solutions” has sold out (thank you!) and will not be reprinted. But the book remains available in digital form and can be downloaded to your Kindle or other reading device, your computer, your tablet or your phone.